The Captive Key functions as a hybrid of a Single Cylinder, and Double Cylinder Deadbolt. The inside part of the Hecular incorporates two cylinders. When the user wants the Hercular to act as a Single Cylinder Deadbolt they will insert a special key with a thumbturn attached to it, into the central cylinder. There is a piece inside which locks the thumbturn into the lock itself. This way it will give the user the safety of being able exit the door without having to search for a key. When the user would like to convert the Hercular into a Double Cylinder application, they will simply insert their normal key into the other cylinder on the inside portion of the Hercular, turn, and the thumbturn key will be removed. 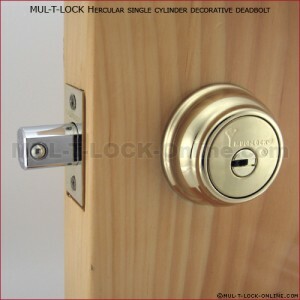 This will make the Hercular into a Double Cylinder Deadbolt, and give the user the security of Double Sided Locking. Cylinder Plug & Bolt Finish: Bright Brass or Satin Chrome.